Roll up! Roll up! 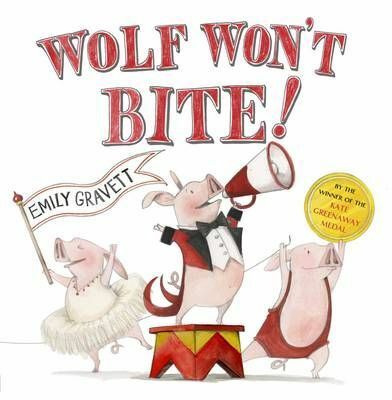 Roll up for a grrreat new book by the amazing Emily Gravett! Take your seat in the front row and watch in wonder as three cheeky little circus pigs make a wild wolf jump through hoops (literally), endure feats of astounding derring-do, and even withstand perilous games of dress-up. Safe in the thought that "Wolf Won't Bite!" they even put their heads between his jaws ...but can you push a wolf too far? Sure to strike a chord with anyone who has both a pet and a young child, this is a very funny and playful story with a snappy ending!